WebOS users who love Twitter are a really lucky bunch. There are some great Twitter clients out there, with Bad Kitty, Carbon, Twee and many more all vying for your attention. It’s strange, as the HP webOS App Catalog has far fewer apps than any other smartphone platform, yet the ratio of excellent Twitter apps is astonishing. If HP can replicate that kind of quality across all the other types of apps then Apple and Google really will be looking over their shoulders. The latest heavyweight to step into this already crowded ring is Phnx (pronounced Phoenix), an app that has been available as a beta previously, but in an almost completely different form, if memory serves correctly. It did have a Windows Phone 7 vibe to it that, while impressive didn’t really fit with webOS too well, in my opinion. Maybe we will see that version resurrected for Windows Phone 7 in the distant future. It’s a good thing it did change, as the app, as it stands now is perhaps the best Twitter app available. Not just for webOS, but for any platform. 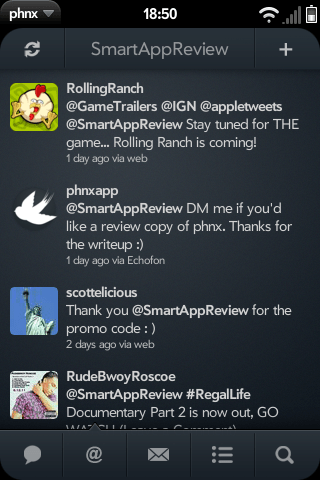 Believe me, I have used just about every major Twitter client on iOS, Android, WP7, webOS as well as the desktop apps. I think that Phnx beats them all. A bold statement, but I challenge anyone to try the app and not be extremely impressed. It does need some fine tuning with a few features, but even so, this app is how Twitter should work on a smartphone. Twitter should be able to be used without interruption, annoyances or GUI problems. It is a constant, endless stream of information, so the way you access that information must surely be likewise: a flow of work across multiple streams of information, simple and powerful without pause or misstep. That is what Phnx does. The app utilises a panel based system, whereby you swipe left or right to switch between your home timeline, mentions, direct messages, retweets and trends. Typing at any time when the app is open will create a new tweet for you to post, with a simple camera button to upload a pic either from the camera or your photo library. Touching a tweet in your timeline bring up options of retweeting it, with or without comment, replying or marking it as a favourite. The app can be refreshed either by touching the refresh button in the top left hand side of the screen or, taking a note out of Bad Kitty’s book, by using a forward swipe in the gesture area. This should be a prerequisite for all webOS apps, by the way. Touching your name at the top brings up your profile, and from here you can then swipe the same between your own tweets, mentions, favourites and your actual profile information with followers, etc. 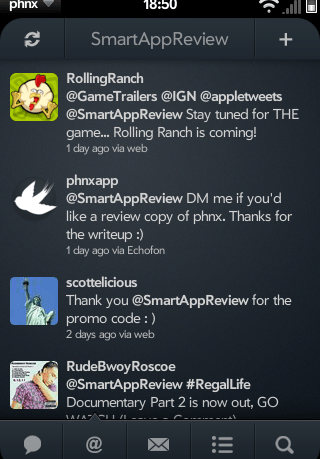 If you are reading this and have used a few webOS Twitter clients before, then you may recognise some of the features and environment descriptions, well that’s because Phnx has taken all the good from other apps and none of the bad, to create an extraordinarily refined experience. Carbon is the app that this shares a lot of basic elements with, but I have to say that Phnx out performs the already blazing fast Carbon, not only in terms of the speed at which it retrieves your tweets and other information from the internet, but also in the smoothness of every action. Swiping between the screens doesn’t ever cause any judder or loss of speed, and when the app is pulling tweets from the web, aside from a small status bar waking up along the top of the screen, you wouldn’t know that the app is working hard. The app is also gorgeous, and in an understated way, with the text always clear and readable. The two included themes(with more on the way), are both lovely to look at, and offer just the right level of contrast with the tweets and profile pictures. While not as immediately attractive as something like Bad Kitty is, the approach the developer has used allows for a better app that never seems to get bogged down, and the more you use it, the more you realise that this is a beautiful Twitter app. If you are waiting for a ‘but’, well then here it is. But…it’s not all perfect. The app is missing a few options that are in more established apps, such as the hash card from Carbon and, while allowing a background service that can notify you of tweets, mentions and DM’s after the app is closed, the main timeline doesn’t appear to update when the app is in card view. The multi account support isn’t quite as robust as it could be, but setting up a new account is a breeze compared to other apps. All small issues, and I hope that, when the developer adds options and features to the app as time goes by, they try to make sure that the app doesn’t become as bloated as something like Tweetcaster is on Android and keeps the clean, smooth style. There are a few great little extra touches that really make the app, such as the ability to see how many times a tweet has been retweeted, the fact that, when you have multiple accounts in card view, they are marked with your profile pic, and the way the app lets you mess around with a tweet without ever forcing you to exit your timeline. This is, aside from the minor things I mentioned, a fantastic app, one that is easier and smoother than anything I have ever used on any platform. Elegant and simple yet with sophisticated and intuitive features and a great use of the webOS feature set, this is as good as it gets, and sets the standards for all future Twitter apps. In my humble opinion this is, quite simply, the best Twitter app in the world. perchance have you used Carbon?